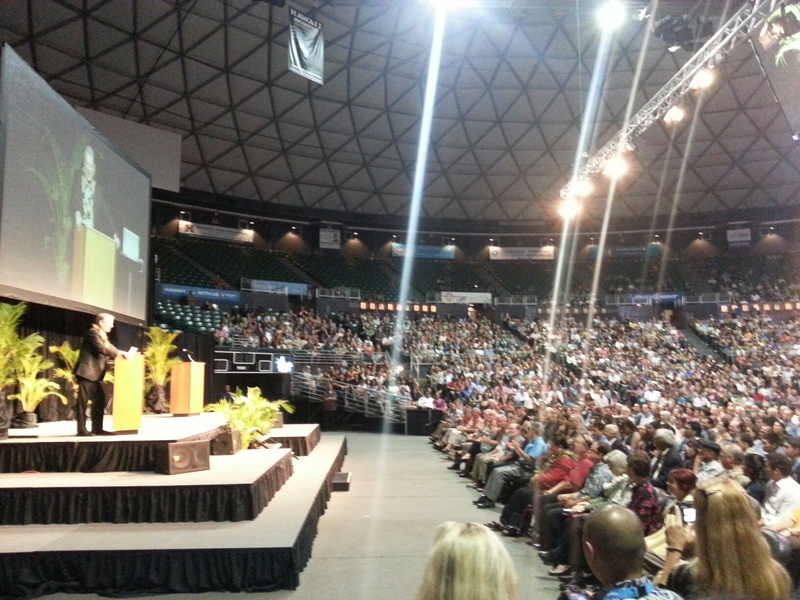 Former Vice President Al Gore delivered a powerful address to a packed house at the Stan Sheriff Center at the University of Hawaii at Manoa last night. Environmentally, Gore is most famous, perhaps, for his 2006 speaking tour and subsequent documentary called An Inconvenient Truth, but as opening speaker Senator Brian Schatz pointed out, Mr. Gore has been a climate change and environmental champion throughout his long career. Schatz, the current U.S. Senator from Hawaii, said he was inspired by Earth in the Balance, Gore’s breakthrough work of nonfiction that set Gore’s path to a run for the White House in motion. Gore, in turn, after coming on stage, said that he was inspired more by Schatz, a freshman senator who managed to organize an all night session on the Senate floor with some 30 senators to discuss climate change and urge action from their colleagues. “Do you have any idea how hard it is to get that many Senators to do ANYTHING? Let alone spend a whole night at work?” Gore quipped. The other game changing occurence in recent years is clean technology. There are 79 countries where the cost of solar panels have dropped so much so that these countries have achieved grid parity with solar power. Gore compares the current climate denier industry to the tobacco industry 30 years ago. Back then, he said, when science had proven that smoking was bad for you, the tobacco industry paid actors to dress up as doctors, gave them a script, and they went on TV and told the world that there was absolutely nothing wrong with smoking. Gore said that climate deniers who pollute and make money from it are doing the same thing now. “It’s immoral, unethical, and despicable, and we need to call them to account for it!” he implored the audience. And it’s happening around the world. The Vatican, Gore said, is set to become the first carbon neutral nation. “I’m a Southern Baptist, but I could convert to Catholicism!”, he said. As for the science, the consensus continues to grow. Gore said that last year, over 9100 scientists around the world published climate science papers in peer-reviewed journals, and literally, only one of them opposes the majority view that climate change is happening and that we’re causing it. “Climate change is indisputable”, according to a Joint Statement issued by climate change scientists globally, shown in the slide show Gore was giving.